KANE COUNTY – Two hikers were rescued by helicopter Monday night after getting lost and running out of water while hiking near Zion National Park. A couple had been hiking in the area of Checkerboard Mesa, Classic Air Medical spokesperson Chad Bowdre said. “They had been hiking for a day and had gone 23 miles total,” Bowdre said. However, the pair lost the trail in slickrock, and then ran out of water before setting off a personal locator beacon, he said. “They were lost for 10 hours and out of water for four hours and were struggling a little physically,” Bowdre said, when they set off the beacon. The couple had parked one car at Checkerboard Mesa and another vehicle near Mt. Carmel Junction. Air Medical got the call shortly before 8:30 p.m., Bowdre said, and because the personal locator beacon coordinates are very, very accurate the helicopter crew was able to fly directly to the lost hikers’ location. “We got right over the coordinates and saw two people using shiny headlamps to signal,” he said. Even though lost and in distress, the hikers did almost everything right to ensure a successful outcome. The GPS coordinates received placed the two about 1.7 miles south of the eastern Zion National Park entrance station located on state Route 9, Kane County Sheriff’s Office Chief Deputy Alan Alldredge said. “They had been hiking in the Barracks/Fat Man’s Misery area and were returning to their car at Checkerboard Mesa,” Alldredge said. Fat Man’s Misery is the West fork of Misery Canyon, according to canyoneeringusa.com. 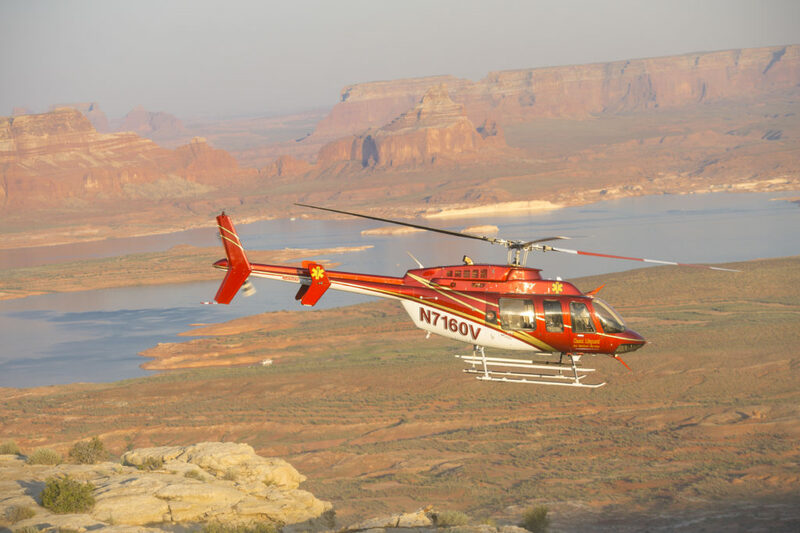 “Because of the remote area they were in and the possible medical emergency, we contacted Classic (Air Medical), who has a medical helicopter stationed in Kanab, and asked them to see if they could locate the hikers,” Alldredge said. The hikers were located quickly and one was flown to Dixie Regional Medical Center in St. George. The helicopter then returned and picked up the second hiker, who was returned to a vehicle at Checkerboard Mesa in Zion National Park. The trail the two were hiking is mostly outside of Zion National Park, park spokeswoman Aly Baltrus said, and so Kane County responded with their search and rescue team. “They did find the hikers just inside the park and were able to help them,” she said. Personal locator beacons are a good idea, Bowdre said, and a basic model can be purchased for about $100. Higher-end models allow texts and emails to be sent via satellite, and the devices work where cell phones don’t. Just a couple of dumbob’s out there not leaving bread crumbs behind them. will them dumbob’s ever learn ! Don’t worry Dumpster, if you ever get lost we can just follow the trail of pills.